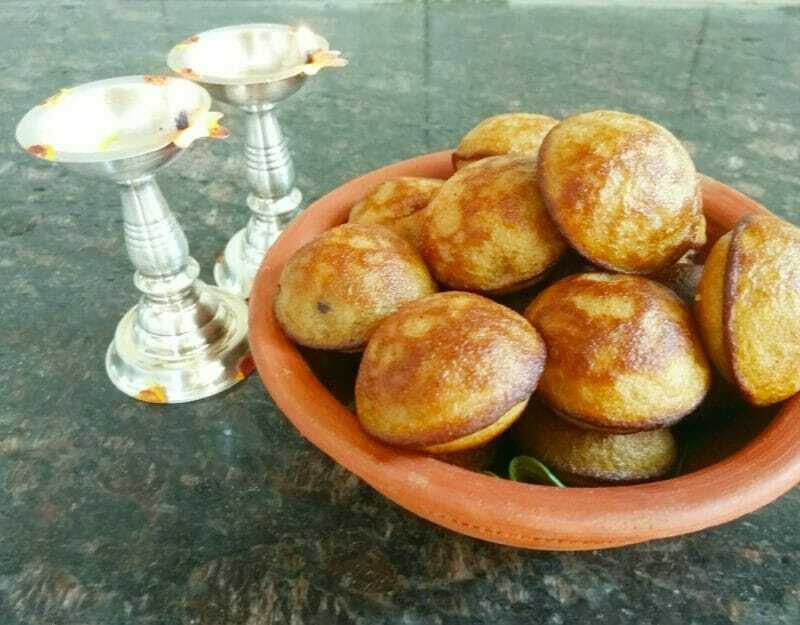 Neiyappam is one of the Kerala delicacy which is generally made during festival times. Soaked rice is made into batter by grinding along with jaggery and coconut. I used foxtail millet for this recipe. Neiyappams are offered to Lord Krishna on Janmashtami. Using a blender grind to a smooth batter adding just a tbsp of water. Once done, cut bananas into pieces and grind along with the millet batter. Next add coconut, cardamom powder and jaggery powder. Blend everything smoothly without water. Transfer to a vessel and leave aside for an hour. Just before making appams add baking soda and give a good mix. Now heat a paniyaram/appe pan on medium heat. Pour a tsp of ghee in each depression. Pour small ladle full of batter (enough to half-fill each depression) into each depression. The batter will sink to the bottom of the depression and the ghee will rise. This is fine as it will ensure that the top part of the neiyappam also gets cooked. Once the bottom portion is cooked and gets a nice brown colour, gently flip and cook till the other side is also cooked well. once done, remove them on a paper tissue. The neiyappam was a super hit in our household. I substituted coconut sugar for jaggery and it tasted really good. It also didn’t need a lot of ghee since the pan was non stick. Thank you for this wonderful and creative recipe!! Glad to know that your family loved the neiyappam. Thanks for letting us know your experience. All the validations makes the recipe strong.